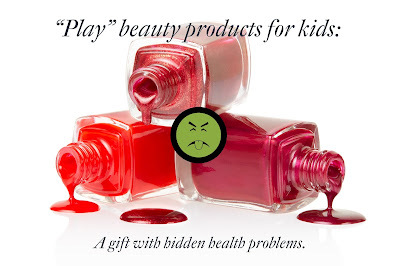 "Play" beauty products for kids - a gift with hidden health problems. Unfortunately most people are buying their daughters, nieces, fabulous little boys and grandbabies very cheaply made products packed with hormone disrupting chemicals, synthetic colorants, petroleum compounds, and synthetic preservatives. Even worse, the additional chemical load can affect kids even more than a fully grown adult. Their systems are developing and changing quickly, and genes are being turned "on" and "off" by their environment and experiences. Anything that can alter that is something to consider carefully. Hormones especially are subtle compounds, and a little this way or that can cause a lot of change. That is why hormone disrupting chemicals should have you acting like the bouncer at an exclusive nightclub keeping their skeezy selves out. They'll ruin the party, if not right away then later as they try and pair up with all the pretty estrogen receptors. Endocrine disruptors act as hormone mimics and blockers depending on the situation and the compound. They can sit in the estrogen receptors and other hormone reaction sites and block hormones from chemically matching with where they need to be. They can also turn hormonal functions on and off sometimes too. This is big trouble for the littles. The earlier in life that the human body is exposed to especially hormone disruptors like pthalates the greater the long term damage can be. Eventual results with habitual exposure can include abnormal hormonal development, fertility problems, and eventually even cancers of the endocrine system. A future of chronic disease and pervasive hormonal dysfunction is not the kind of gift you want to bestow on the next generation. Nail polish is one of those products that little girls adore, and yet is the most insidiously harmful for health, as it has for generations been made up of solvents that otherwise would come with a litany of warnings. Just as a sample let's review how Toluene, a solvent in conventional nail polish, would generally be labeled. Toluene safety label text: "Highly flammable liquid and vapor. Causes skin irritation. May be fatal if swallowed and enters airways. May cause drowsiness or dizziness. May cause genetic defects. Suspects of damaging the unborn child by inhalation. May cause damage to the central nervous system by inhalation." My daughter has far more time to paint her nails than I do. That means a lot more chemical exposure. For your little ladies (or any polish lovers) we are delighted to share an upgrade that will let the kids feel pretty and you feel like they are protected. a Physician-Formulated collection of nail colors, base and top coats, and natural, fume-free soy based remover. They sell online and through stores like Blissoma Botanical Beauty. AILA offers a lovely range of more than 25 colors in shades from reserved to rowdy that will make all ages happy. Even their polish remover is nontoxic and healthy for nails. It is completely odorless and made with soybean esters that gently remove polish from the nail and leave it nicely moisturized. - TPHP, another endocrine disrupting compound science has just been identified that is in even many 5-free polishes. 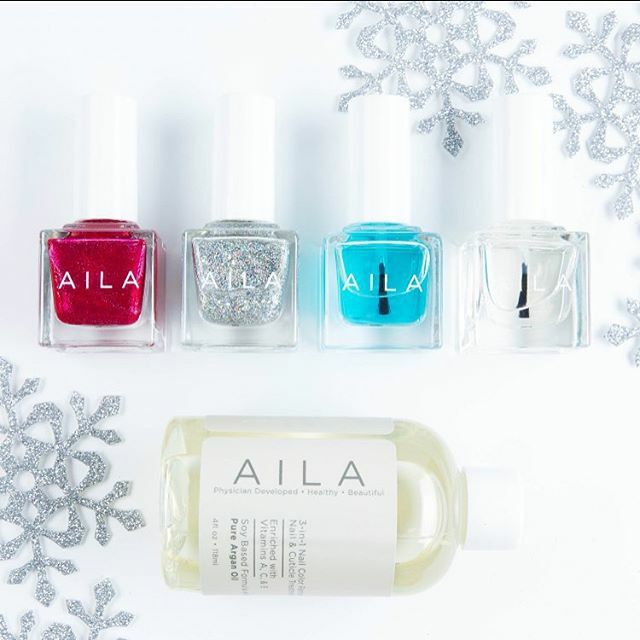 The lack of TPHP makes AILA unique in the nontoxic polish world. How do all the junky chemicals get from the bottle into our bodies anyway? Your fingernails are not impervious surfaces. You are not Lady Deathstrike and they are not made of adamantium, though I'm sure that we all often pretend like they are when attempting to perform tasks such as trying to use a fingernail as a screwdriver because despite having purchased an entire set none are anywhere to be found at times of need. (or is that just me?) Fingernails are porous and can absorb chemicals that are put on them. You also inhale the vapors during application - that characteristic smell is the aroma of nervous system damage. OSHA even has a special mention on the health hazards that nail techs experience as part of their jobs being exposed to glues, polishes, removers and more. "Workers exposed to chemicals found in glues, polishes, removers, emollients and other salon products may experience negative health effects such as asthma and other respiratory illnesses, skin disorders (e.g. allergic contact dermatitis), liver disease, reproductive loss, and cancer." Uh, yeah. So tell me again why we are letting our kids fool around with cancerous solvents? I'm thinking "because it's pretty and that color is in season" is just not enough. Some polishes available at larger chain stores like Essie and even Sally Hansen have gone "3 Free" which means they are free of Toluene, Dibutyl Pthalate, and Formaldehyde. That's better than nothing, but we were super excited to find a line like AILA that was brought to life specifically to bring us the fun of polish without the risks of the additional chemicals. 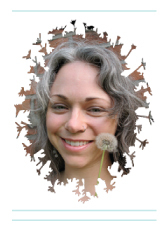 As well, when big lines eliminate chemicals that are getting bad press sometimes they do so without adequate research and care, which makes the attention that Dr. Cary, the AILA founder, has given her work extra special. Note: It is not news to me as a formulator and chemistry-lover that there can be problems with some "replacement chemicals" that are quickly substituted into conventional beauty products without adequate research. Firstly industry wants a fast replacement, and if there is no research there can be no direct harm proven, so they stick something in that isn't the old stuff. Zippity-doo-da, it's new and improved! The new compound may be a mimic of the old one and just go by another name, or it may be a totally new can of worms. If you're buying a beauty gift for a little one this holiday season or anytime we want to ask you to please buy clean, natural, nontoxic beauty products. Look for declarations like "5-free" on nail polishes for the cleaner options, or even better look for brands that declare TPHP-free (there aren't many yet besides AILA). 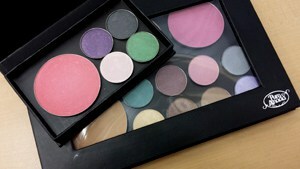 For makeup please look for plant-based recipes and no FD&C colorants. A line that specifically declares their colors are solely mineral based is best. And skip all the synthetically perfumed lotions, shower gels, and spritzy stuff (whether cheap or designer). Synthetic fragrances are like taking a bath in Pthalates, one of the worst types of endocrine disruptors. While nail polish companies have been working to remove it the fragrance industry hasn't budged much. Pthalates allow them to make fragrances seem stronger and last longer, and it seriously screws with their product structure to eliminate it. Pthalates do absorb through skin and should be avoided as much as humanly possible. Drop the freesia body spray like it's hot. Yes, cleaner products sometimes cost a little bit more and you will almost assuredly not find them at the mall, but the peace of mind they buy is priceless. When the wrapping paper is off, the bottles are empty, and your children are grown you'll know that they didn't get left with nagging health problems as a result of prettying up. Health and wellness is the best gift of all.